The Grey Cairns of Camster are two of the best preserved Neolithic chambered cairns in the Britain. They can be found beside an unclassified single track road which heads in an almost straight line due north from the A99 near Lybster before emerging on the A882 near Watten. They are a little over five miles from Lybster and some eight miles from Watten. The Grey Cairns are well named, all the more so if you catch them on a driech day. And if you visit on a still and cloudy summer's evening make sure you bring your midge repellent. You can usually avoid midges in Caithness, but the peaty upland around the Grey Cairns provides them with ideal conditions. The two cairns are very different in appearance. One forms a circular structure some 18m in diameter, while the other sprawls along a ridge line for just under 70m. 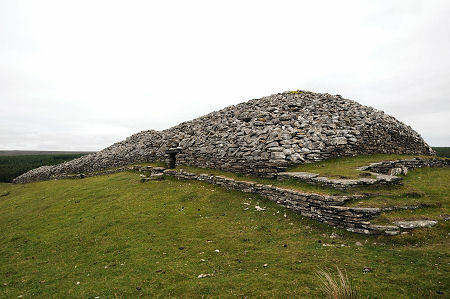 Both were built during the Neolithic era some 5000 years ago, but there are signs that the round cairn is the earlier of the two. A wooden boarded path leads from the roadside parking to the round cairn, then from it to the long cairn, and then back to the road. Camster Round Cairn is nearly complete, though the stones on the roof have largely spilled over the kerb which would originally have surrounded it. It measures 18m in diameter by some 3.7m high. 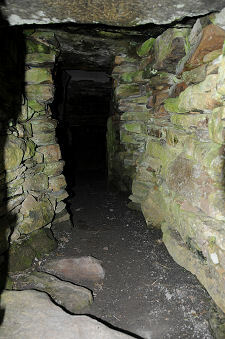 A very low and narrow passage leads into the central chamber, which retains its original corbelled construction. During modern restoration a rooflight was added to allow visitors agile and svelte enough to tackle the passage to see the chamber when they reach it. Excavations in the 1800s revealed burnt bones, pottery and flint tools, along with the remains of a number of skeletons. Camster Long Cairn is worth visiting last as it is by far the more impressive of the two. It gives the impression of great size, and is 69.5m long. At the two ends there are "horns" where the structure extends outwards to help define forecourts. The northern forecourt incorporates an unusual platform which is now grassed over to protect it. 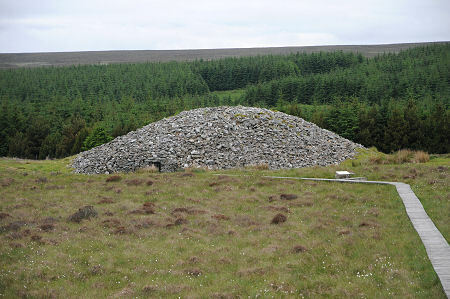 There are two internal chambers, both towards the north end of the cairn and both accessed by passages from the east side of the cairn. The internal chambers had collapsed at some point, and are now roofed with fibreglass domes. Again, light comes in from the outside and the passages here, especially the one nearest the centre of the cairn, are slightly less of a squeeze than the one in the round cairn. It seems that originally there were three cairns at Camster, all built to the same round pattern. At some later time it was decided to incorporate two of them into what then became the long cairn. Excavations of the long cairn in the 1800s were more destructive and less well recorded than those of the round cairn, so it is not known whether evidence of burials or grave goods were uncovered: and nothing was found during more modern excavations.